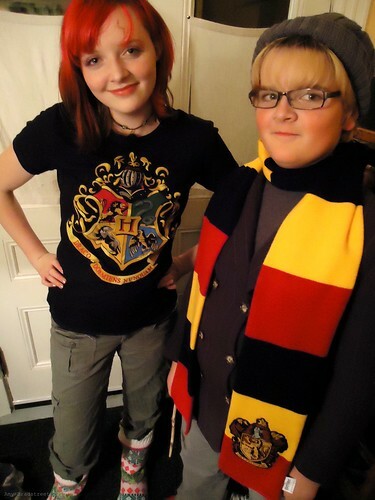 Since our kids are part of the Harry Potter Generation, Adam and Olivia have been very excited for the release of the first movie installment of Harry Potter And The Deathly Hallows. 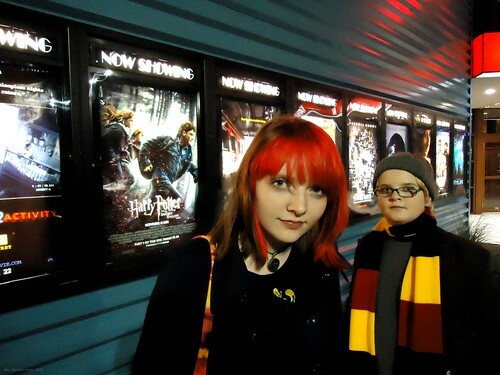 This time, they really wanted to see the midnight opening of HP7. No problem, we got our tickets a week in advance and planned to arrive early. Of course there was the trip to the mall yesterday afternoon to get the associated, coveted paraphernalia (a scarf and a t-shirt). Then there was the scar drawn by Adam on Olivia's forehead and Adam bringing not one, but two wands with him to the movie. 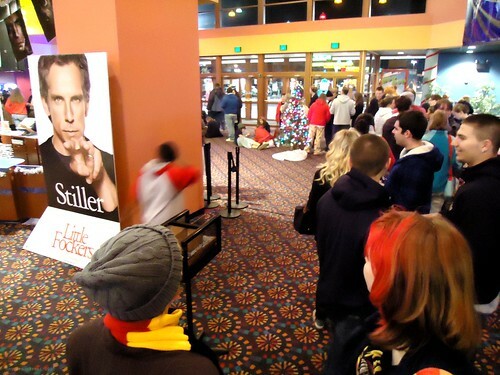 Upon our arrival at the cinema, we worked our way to the end of the long line that wound itself around the theater. Most of the people there looked to be about late teen to early twenties. There was a group of young women dressed in sheets, wearing SPEW buttons, with floppy elf ears pinned to hats. Another woman was dressed as Hermione, another group was wearing Slytherin robes and lots of people had Gryffindor scarves and lightning bolt scars. Fifteen minutes later we were seated. 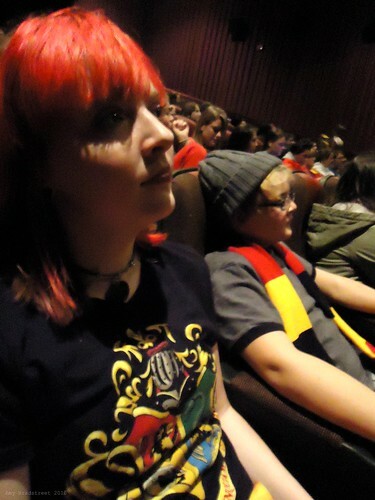 Our seats were a bit close, but we were sitting together, so we were content. For an hour we riffed on the terrible and repetitive pre-show movie trivia questions and car dealer ads and listened to all the excited chatter about the book and movie. And the SPEW gang was sitting behind us, so we heard all kinds of great stories about college drinking parties and how chemistry class was going to be so tiring. To loud and grateful applause and cheers, the lights dimmed and the previews began. The oddly, cobalt blue tinted previews. Erm... Just checking, but The Green Lantern is meant to be um, green, correct? Well, it's just the previews, I thought, and it might be because we're closer to the screen and the digital film gets distorted close up...these were the things going through my head. Then the movie began. Everything was tinted that same cobalt blue, some scenes were worse than others. We got into the first fifteen-twenty minutes, most of us were bugged but managing to ignore the blue, our palms were sweating, it was tense--the house lights went on and the screen went dark. The staff announced that they were trying to fix the problem with the film and that they would start it up from the beginning so that we get our Harry Potter. Everyone groaned, but it seemed pretty good natured, because hey, we'd see it from the beginning without the blue. Good deal, right? Yeah. This happened, exactly like I just wrote, four more times, with at least two or three more non-starters. Yes, that's right, we literally watched the Coke ads, the previews (and can I just say right here, that Yogi Bear movie? It just. Never. Gets. Old.) four or more times. (As for the SPEW gang, they were all turned inside out, because omg,omg, I can't I just can't do it again, I can't) times four. Also? Never got old. We saw the movie. The non-blue, awesome, deeply satisfying-the images just pulled from our brains-improved acting-visual effects-by the book driven-movie. We loved it. It was so worth waiting for it. Really, really. aw man i think i would've fallen asleep! 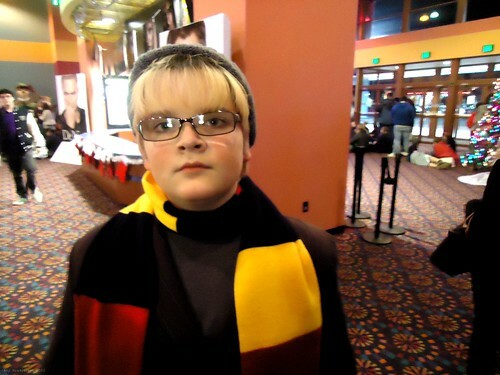 Remember that time we went to see Harry Potter at the midnight showing...OMG, you nailed it. Wow I'm tired. I know one of the things I loved about it was that it was SO PRETTY! And the scene that Harry and Hermione were dancing and Neville "Hey, losers, he's not here." Just UGH so amazing! When Nagini jumped out of the abyss at Bathilda Bagtshots I was the only one in my theater to scream and everyone laughed at me. OMG:-) Are you still sleeping?? I haven't seen it yet, I'm re-reading the book right now and I. Can't. Wait. well-- i'm glad you finally got to see it. i'm pretty sure it would have driven me cuckoo.